Your Questions, My Answers - Welcome To Staley Strategies Online Fitness Coaching! Q: Hi Charles. I’m a 44-year old guy who’s just gotten back into lifting after about 15 years of being pretty sedentary. What I’m wondering is, what is my potential for putting on some decent muscle at this stage of the game for me? A: Your current ability to gain new muscle hinges on a few different factors, age being just one of them. One of the most significant of these factors is your previous training history, and also, assuming that you do have a significant training history, how optimal that training was. For example, if you looked at a pair of 44 year old identical twin brothers, where one brother had trained properly for all of his life, versus the other brother who had never trained, you’d find that the untrained brother would in fact be able to gain a fair amount of new muscle from that point forward, because any training he does will be a novel stimulus to his body, and also because his current levels of muscle are nowhere near his ultimate potential. The trained brother on the other hand, will be hard-pressed to gain any additional muscle — he’s much closer to his ultimate muscular potential, and assuming he’s been training correctly for years, there won’t be much he can do in terms of novel training stimuli to trigger new gains. In terms of the issue of being older, I’m not so sure it’s the age itself that’s the big problem, but the changes that are associated with age. One example would be injuries and health issues that tend to accumulate with age. Another possible problem is declining levels of anabolic hormones such as testosterone (this can be addressed medically of course). Still another obstacle for many people is the increased number of roles and responsibilities that many people assume later in life. But with all of this said, even at 44, if you don’t have an extensive training background, you’re relatively healthy, and your lifestyle allows you to train hard and consistently, I think you’ll be surprised at how well you can do. Q: There seems to be a huge amount of press given to low carb and especially ketogenic dieting lately. Is there really anything to this, or is it just another fad diet? 1) Extreme positions on ether sides of the argument are both inaccurate for the most part. In other words, low carb and/or ketogenic diets are neither a miracle solution, nor an abject disaster. The human body is highly adaptable, and can function to varying degrees of success on various types of macronutrient ratios. I’ve known people who LOVE ketogenic diets, and who seem to thrive on them, and I’ve also known people who can’t seem to go more than a few hours without carbs. 2) The explanation between the wide variety of experiences that people have on low/no carb diets lies on human bio-individuality: Very simply, while people’s similarities do outweigh their differences, there still remains a lot of variation between individuals. As a summary, the less physically active you are, and the fatter you are, the less carbs you need, and therefore, the better you’ll do on a low carb diet. The leaner and more active you are, the less likely it is that such a diet will be optimal for you. 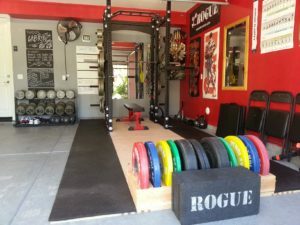 Q: I’ve just moved across country and will have a large (3-car) garage at my new house, but I’m torn about whether or not I should just put together a home gym for the garage, or join a local gym. Can you give me your thoughts on this dilemma I’m in? A: I love this question! 1) Visit all the gyms that are close by, and see what’s available. I’ve got an online client in Amsterdam for example, who has an affordable, fantastically-equipped gym only 300 yards from his home. Obviously, in a situation like that, there’d be little point in setting up a home gym. That’s a rare scenario of course, but first look around and see what you’ve got nearby. 2) There are specific pros and cons to both commercial and home gyms. In terms of the former, you’ve got to consider cost, travel time, and the fact that you might not always have access to the exact piece of equipment you want due to gym traffic — that’s the down side. On the upside however, you might be able to find an inexpensive gym very close to home, and training with other people isn’t entirely negative thing — often, having other people around can increase your energy levels and lead to new friendships, including new training partners. Now for home gyms — the big upside of course is convenience, but lots of people have a hard time training in solitude. Also you’ve got to consider the expense and space involved with dedicating some part of your home to training equipment. Finally, there’s an interesting phenomenon that occurs when you’ve got a home gym, which is that fact that since it’s always available, there’s no urgency to use it. For some strange reason, even if you had to walk a quarter mile, it’d be more likely to happen — that’s why home exercise equipment so often collects dust or a clothes rack. You said: As a summary, the less physically active you are, and the fetter you are, the less carbs you need, and therefore, the better you’ll do on a low fat diet. The leaner and more active you are, the less likely it is that such a diet will be optimal for you. Did you mean to say: “the better you’ll do on a low-carb diet”? YES! Thanks for the catch — just made the edit! I have seen some opinions on both sides of the Belt/Beltless debate. Is it better to go beltless unless you are going for a max lift?